As part of UIKit Dynamics you can add Snap Behavior to a view, which allows it to be “snapped” to a specific location. The view will move to its new position as if it is pulled by a spring. In this tutorial we will let the user click on the screen to "snap" an image into place. This tutorial is made with Xcode 10 and built for iOS 12. 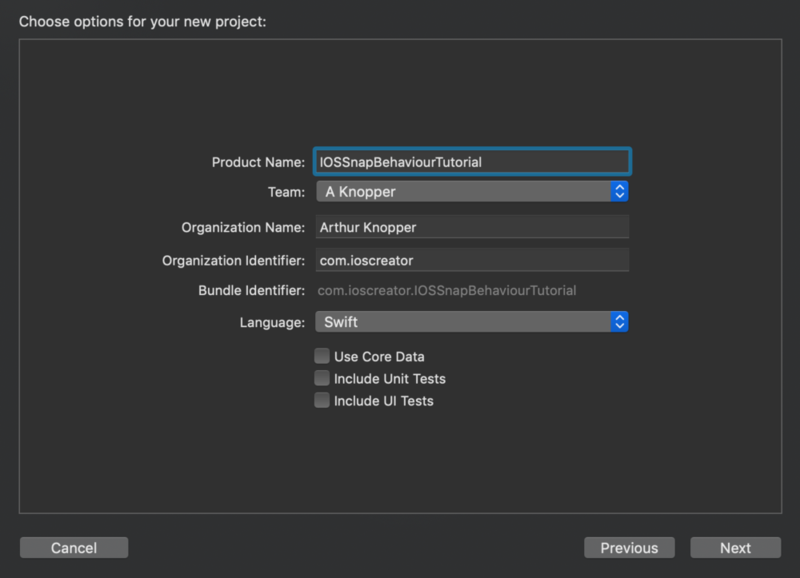 For product name, use IOSSnapBehaviourTutorial and then fill out the Organization Name and Organization Identifier with your customary values. Enter Swift as Language and choose Next. An image is needed in this tutorial, Download this image, unpack it.. Open the Assets Library and drag the image into it. Go the Storyboard and drag an Image View to the main view, Go to the Size Inspector and set the size to 100 by 100 points. Select the Image View, go to the Attributes Inspector and add the apple.jpg file to Image field. The Storyboard should now look like this. First the point is captured where the user has touched the screen. There can be only one Snap Behaviour instance active so we check if there is already a behaviour active. If so, we will remove this behaviour. Next the Snap Behaviour is initialized with the item:snapToPoint initializer. The item is our Image View and the point to snap to is the user's touch input. The damping property is the amount of oscillation the item has of the end of the snap animation. Finally, the Snap Behaviour is added to the Dynamic Animator. Build and Run the project, click anywhere on the screen to "snap" the image to its new location.